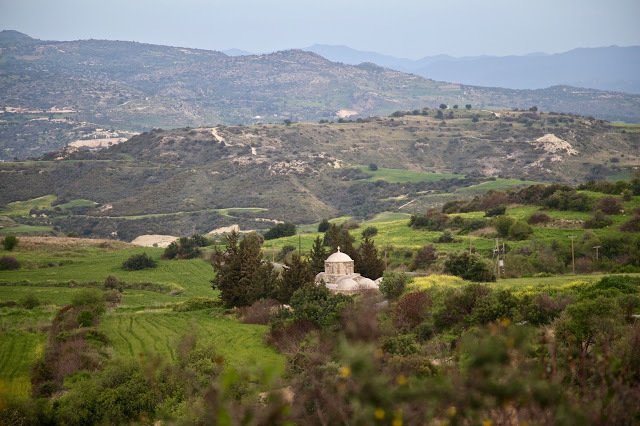 Rural Cyprus: what to eat and drink, where to stay. I’ve visited Cyprus twice: the first time when my daughter was a baby, 24 years ago, and I was still with her father. We stayed at a stuffy hotel in Larnaca. The beaches were beautiful but the town looked like a building site. It was a half-hour bus ride to a gorgeous white beach with a classic turquoise sea. During my visit, I crossed over the green line, a no man’s land of barbed wire and UN soldiers, to the Turkish side. My Cypriot friends were sad. They weren’t allowed to go. 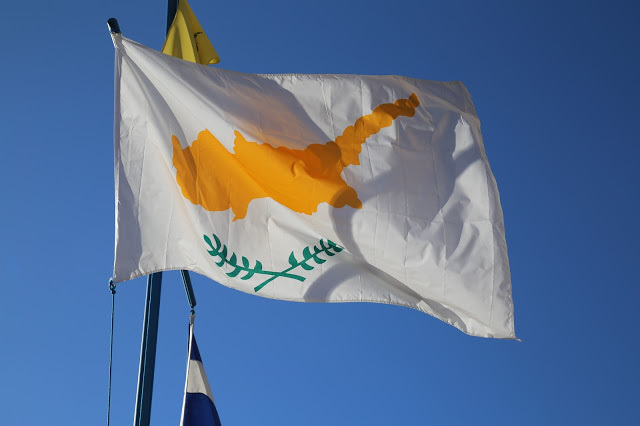 Since the financial crisis of 2012, we haven’t heard much from Cyprus. This time, visiting during Lent, I explored the rustic interior, a more authentic look at the island. Cyprus has mountains! Who knew? Sadly the island is still split: 37% is occupied by the Turks who have sold the homes of Greek Cypriot families to tourists. In one recent incident, a family that returned to look at their old house now occupied by ‘Europeans’, were arrested and spent the night in jail until rescued by the UN. 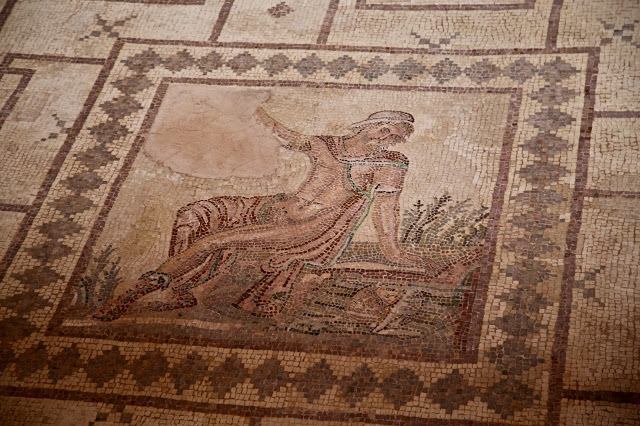 It’s probably because of their complicated history that Cyprus has a vibrant and varied food and drink culture. 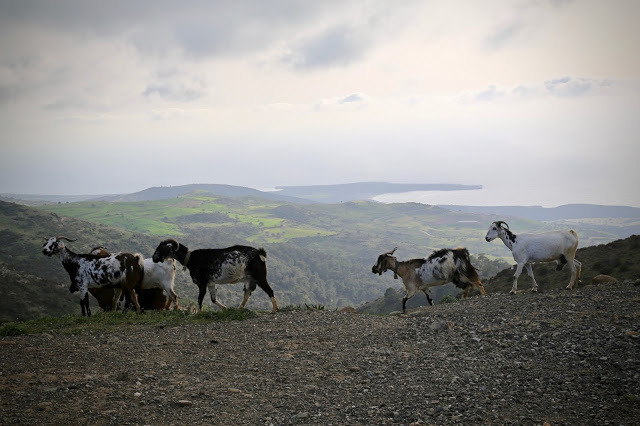 Like Sicily, another great island food culture, they’ve been occupied by virtually everybody over the decades. 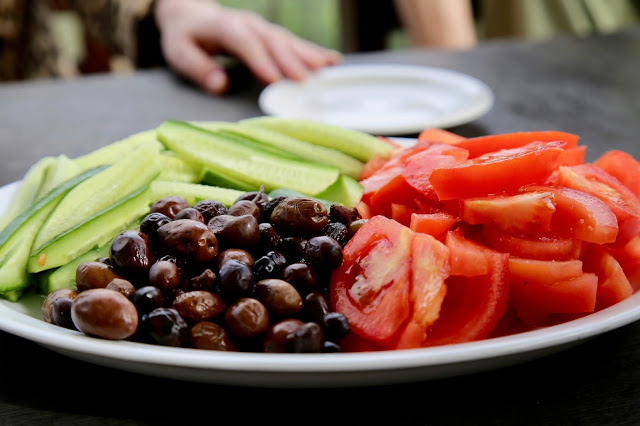 As a result the food and drink sources inspiration from Greece, Turkey, Byzantine, Europe, North Africa and the Middle East. 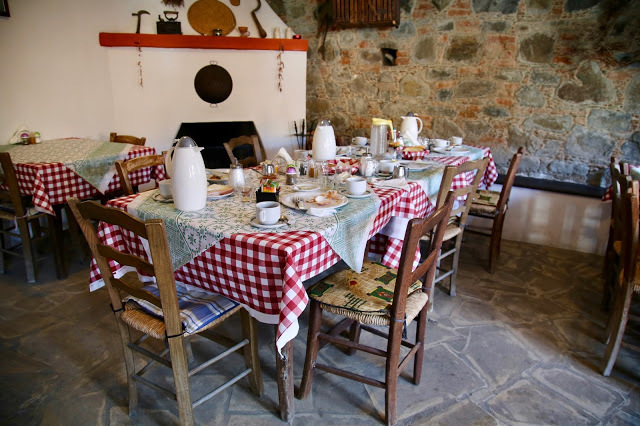 Most tourists visit Cyprus for sun, sea and sand, but you are missing out on the rustic interior. 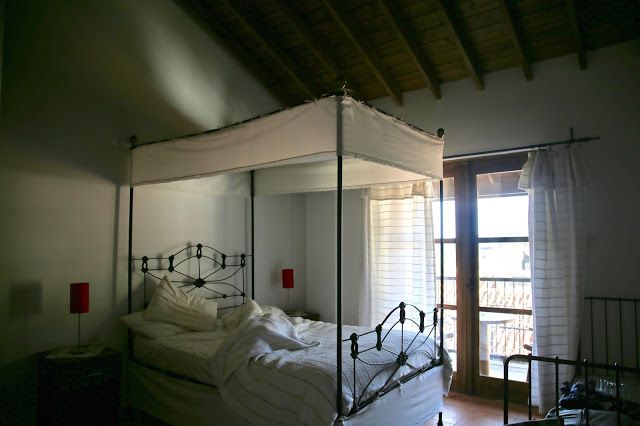 Traditional Cypriot village inns have grand beds with white cotton canopies: ceilings used to be made of mud and sticks and leaves, and the canopies stopped vegetation and insects falling. 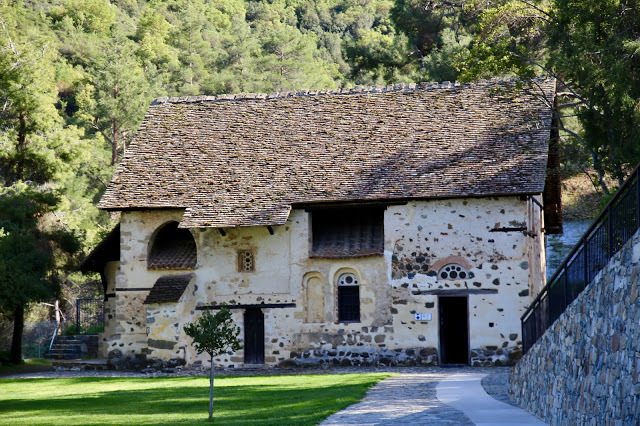 The scenery is stunning: running streams of fresh water, chilly snow-tipped hills, thick stone houses, abundant forests with Cypress trees, after which the island is named. Here is a list of food and drink you must try. 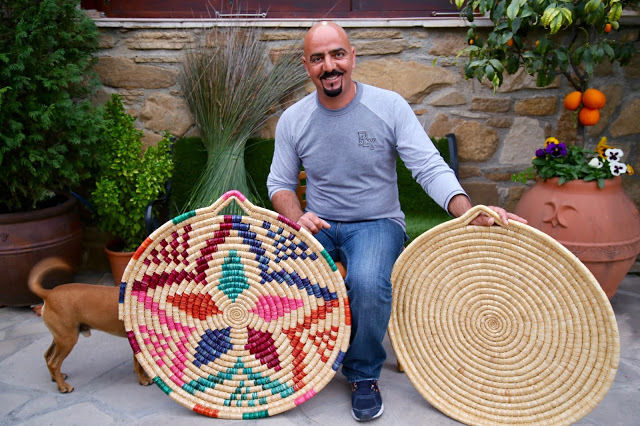 Petros, a former restaurant manager now traditional basket weaver and Halloumi maker, gives demonstrations and runs workshops teaching both skills in a village called Choirokitia. He does everything by hand, the slow way. 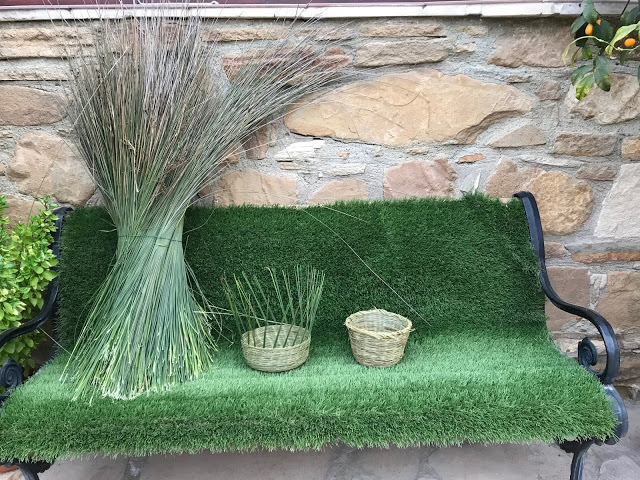 He gets up at 6am to find the water grass, which grows near fresh water for the basket weaving. 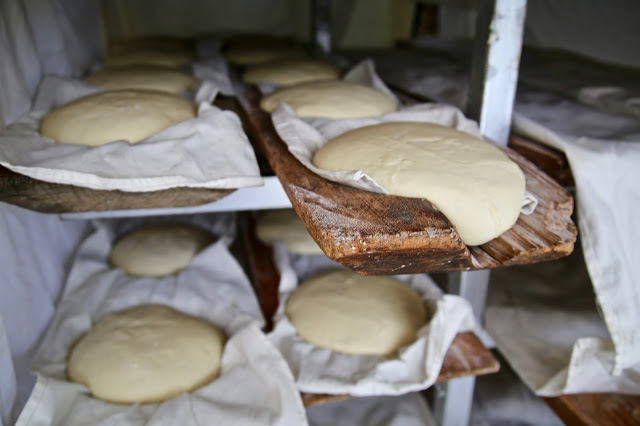 Halloumi, made from sheep and goat milk, doesn’t melt when cooked. 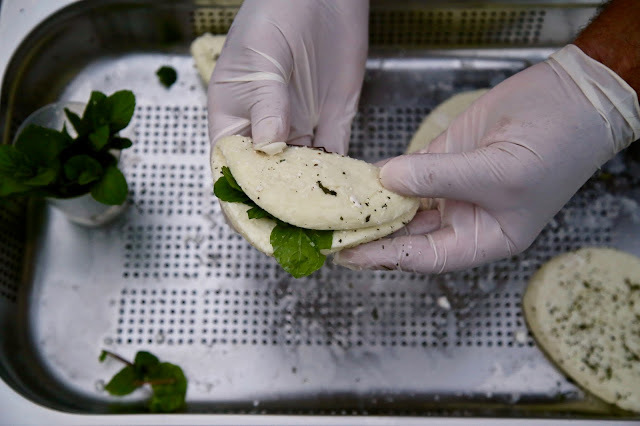 The traditional Cypriot method is to make it in a green grass basket mould, pressing it down, recooking it and adding fresh mint. We watched his billiard-ball brown head bending over the green basket, kneading the halloumi. Eventually it becomes a flat pancake that is then folded over, taco style. 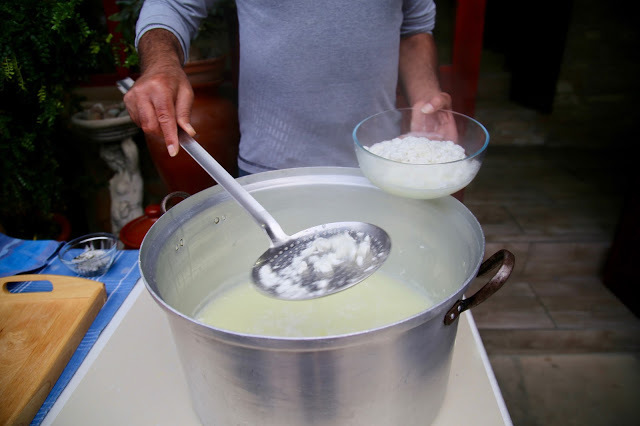 A secondary cheese can be made, Anari, from the whey. 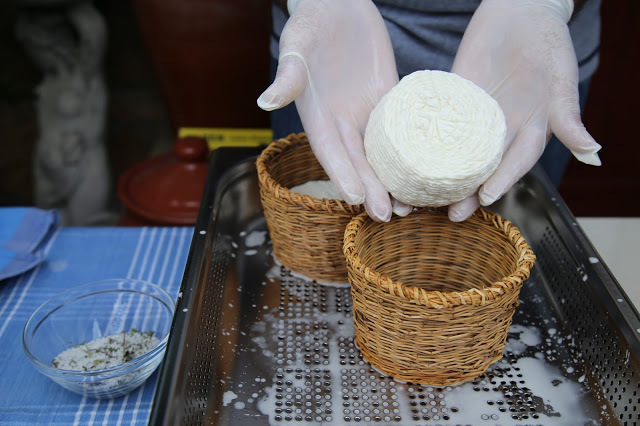 Similar to ricotta, it forms a soft fresh cheese when boiled. Carob trees grow everywhere in Cyprus. The pods are used as a chocolate substitute. The Arab word for Carob, carat, is also used to measure the quality of diamonds and gold. A baker who sold carob rusks explained to me that a certain amount of carob seeds amounts to 1 carat. 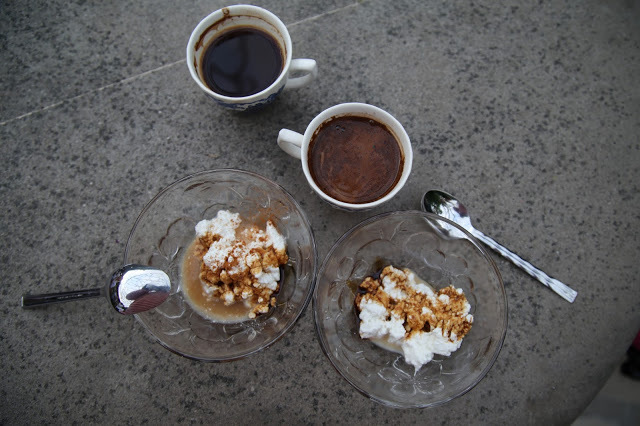 Carob syrup is a popular sweetener, often squirted upon warm fresh Anari cheese. 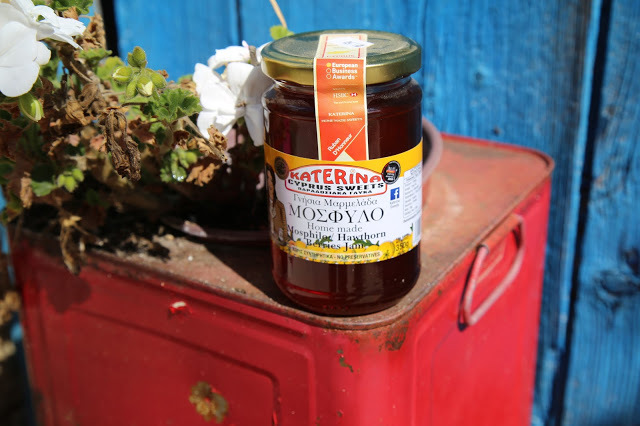 Another treat from was the fresh lemonade, squeezed from the fruit in the orchard belonging to Petros, which we sipped under the carefully trained branches of a mulberry tree covering the courtyard. How did you do this? ‘I’m an artist,’ he proclaimed. 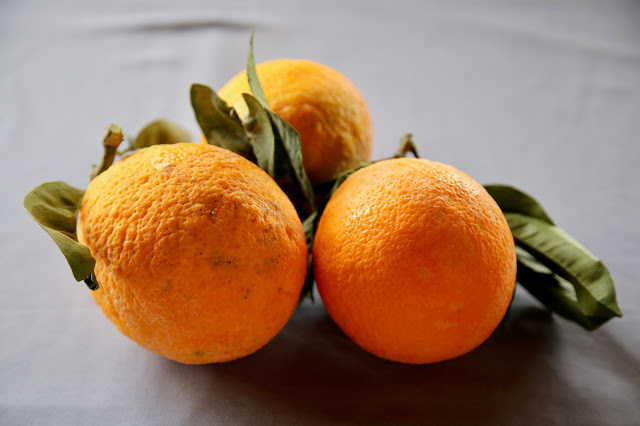 Cyprus produces a different citrus for ten months of the year: pomelos, mandarins, lemons, kumquats, enormous oranges the size of melons, bergamots, sweet lemons and more. I was told of a bitter orange soup, Louvana. 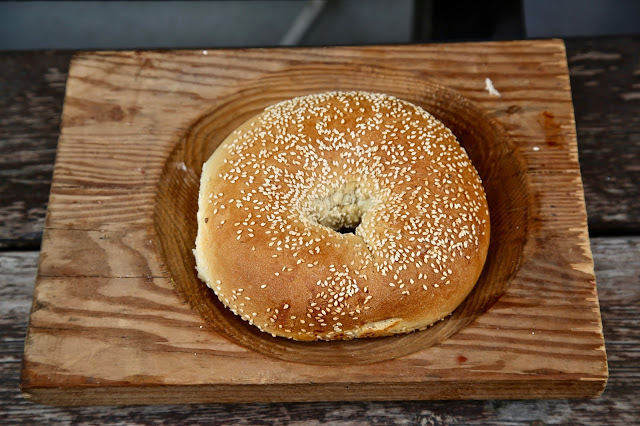 (Recipe coming soon.) There is also the traditional egg lemon avgolemono soup. 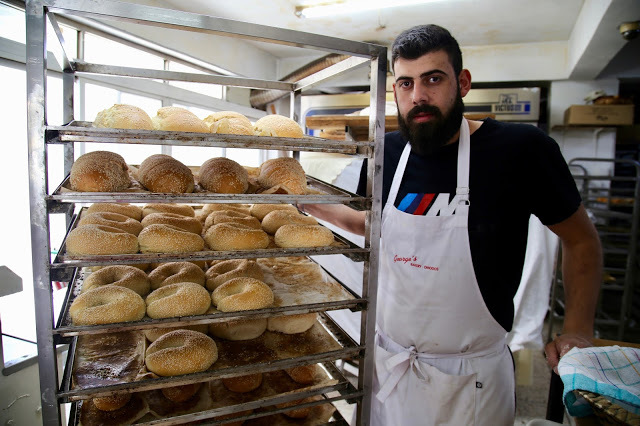 At George’s bakery in Omodos, they sell apkatena bread leavened with chickpea scum, an interesting idea when you consider the advances made in vegan cookery with ‘aquafaba’ as a replacement for eggs. It seems chickpea can also work as a rising agent. This is the oldest named wine in the world. Similar to sherry, it’s a dessert wine dating back to 800 BC. The grapes, Cypriot varieties Xynisteri (white) and Mavro (red) are left to overripen on the vine, boosting the sugar levels, and then left to dry in the sun, further concentrating sugar. 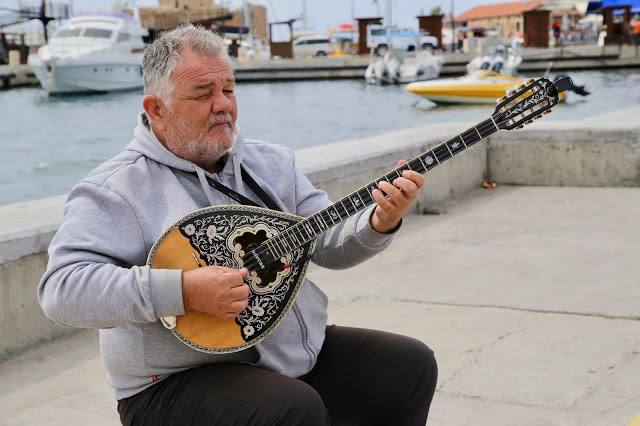 I visited one of the best wineries in Cyprus, Tsiakkas, run by a former bank manager who decided to chuck it all in and follow his viticulture dream. 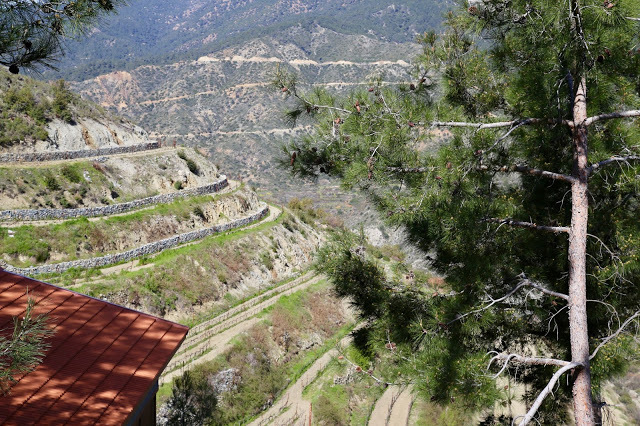 You could see terraces cut into the hillside for new vineyards. Medlar jam tastes a bit like honey, with an interesting slightly medicinal flavour. 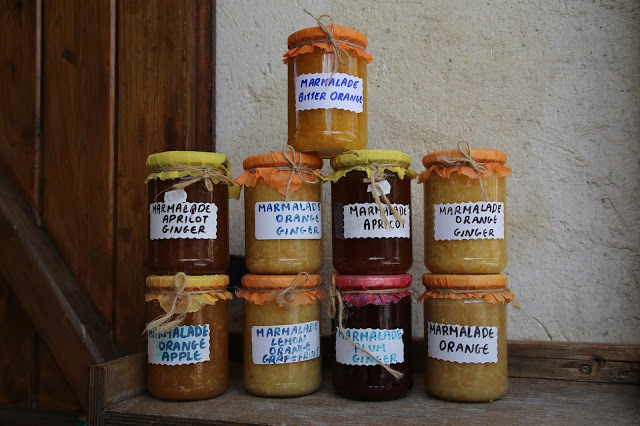 The fruits usually need to be ‘bletted’, that is softened and then cooked down into a clear strained ‘jelly’. Almost every yard has olive trees, almond trees and bulging citrus trees casually lurking about. 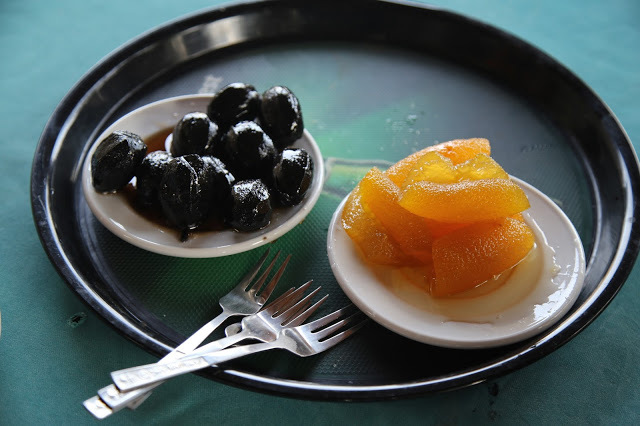 The olives I tasted in Cyprus are some of the best I’ve ever had. Petros’ home-cured green olives with coriander seeds and lemon were sublime. 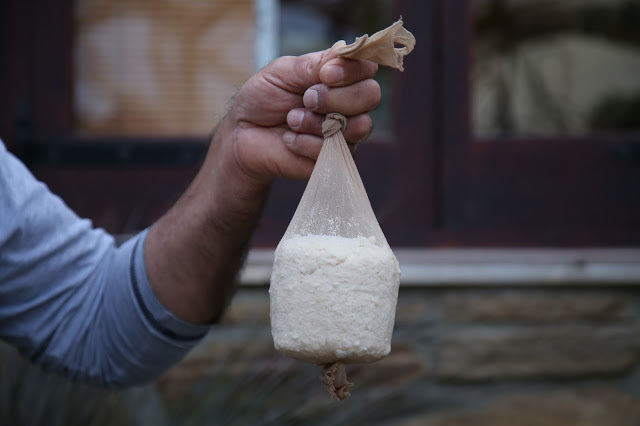 Similar to Greece, Cyprus makes thick sculptural alabaster yoghurt, like cream. 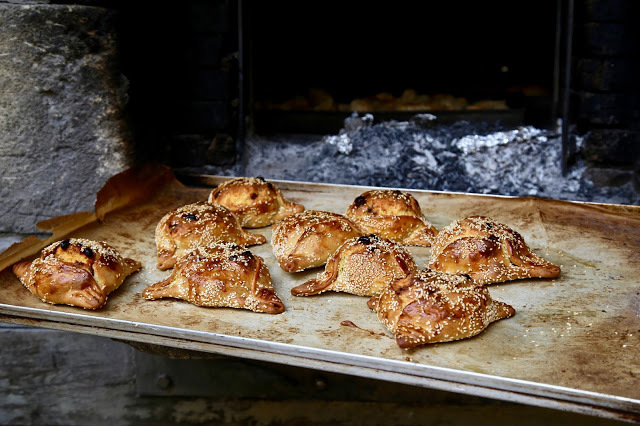 It is served in large bowls for breakfast; mixed with mint and cucumber as tzaziki dip, or with syrupy baklava for dessert. 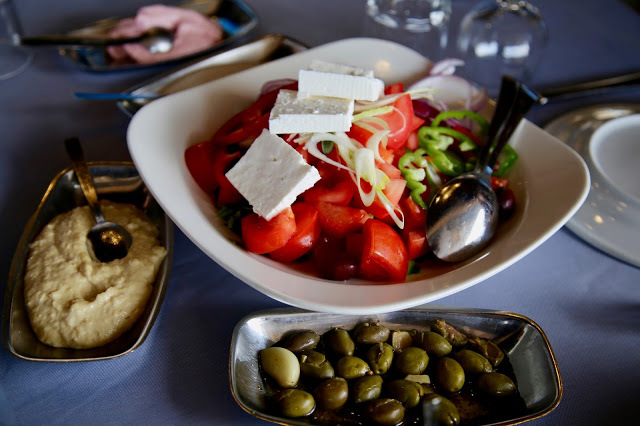 Sometimes known as a ‘Greek salad’, meze are always presented with a large wide bowl of tomatoes, cucumber, olives, green pepper, red onions and feta served with astringent olive oil in tow. I couldn’t get enough of this. 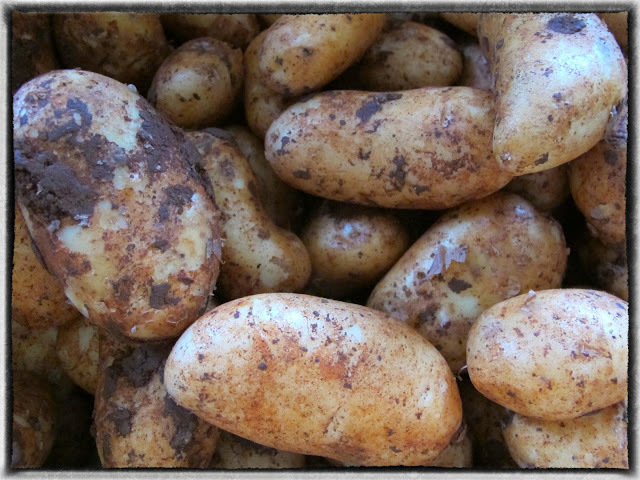 Cyprus is famous for the ‘red’ potatoes grown in burnt ochre clay. Look out for them in the UK from April. 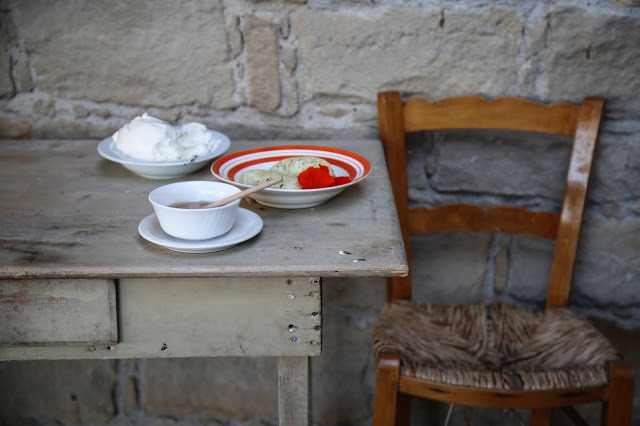 We had a simple dish of potatoes cooked in stock at a village taverna – in the mountains. Delicious, dense, waxy with a buttery colour. Recipe here. George the jeep driver showed me how to make this. In a traditional cafe in a small village, there is a machine with a water tank on top and a trayful of hot sand underneath. 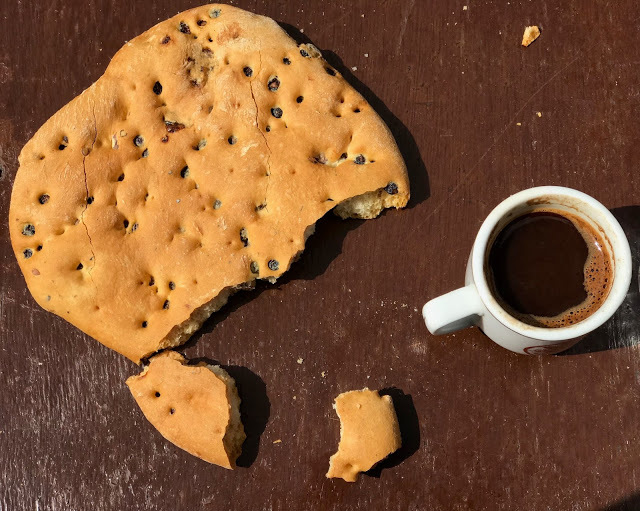 Put a spoonful of finely ground coffee and a teaspoon of sugar for ‘metrio’ (medium sweet) into a small metal pan with a long handle, enough for a thimbleful of Cypriot coffee. Fill with boiling water, using the tap that is filled by the water tank, and place in the hot sand over the fire. When it starts to froth up, pour into the small cup and serve with a glass of water. 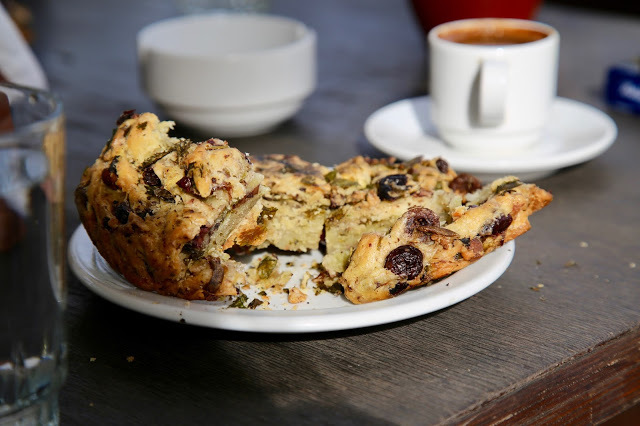 Coffee is often served with trays of ‘spoon sweets’, candied fruit and nuts. 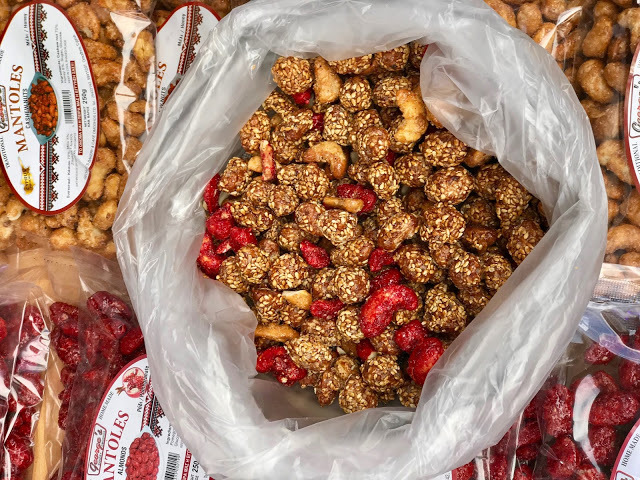 I tried candied walnuts, which are like large black olives as they are repeatedly dipped in syrup before the shells become hard and fragrant thick rinds of orange, simultaneously sweet and bitter. You see nut trees every where in Cyprus, especially in March when they are in blossom. Cashews and almonds are often roasted and covered with pomegranate syrup, studded with sesame seeds. So many aspects of Cyprus remind me of the country Georgia, especially the ropes of churchkela, known as shoushoukos. 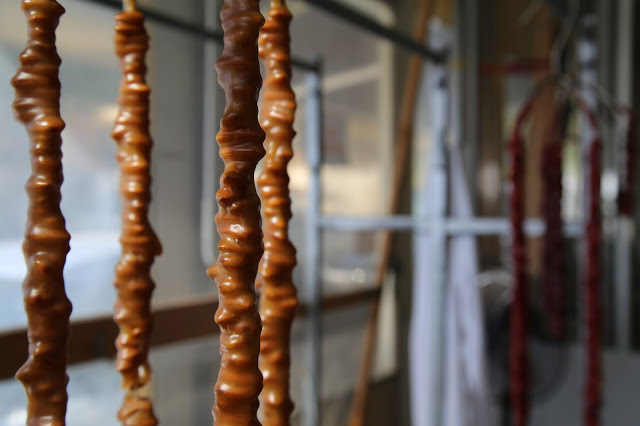 These are strings of almonds or hazelnuts dipped repeatedly in grape jelly, sometimes up to 6 times, to form a chewy snack. This is a pagan tradition that has become part of Orthodox Christinity. 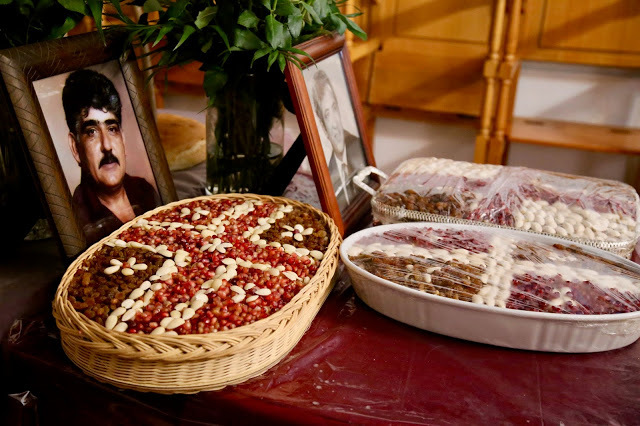 Dishes of boiled wheat, with nuts, pomegranate and seeds, are laid out in decorative patterns with either the initials of the dead or a photograph, placed in church during funerals, Lent and after Easter. Prior to placing it in the church, it is offered to passersby and the community. 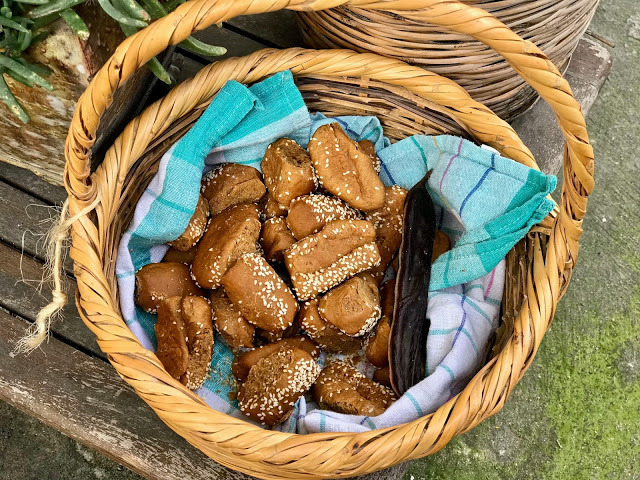 These are rusk-like biscuits with seeds from the pistachio tree. Not pistachio nuts, but some kind of medicinal black hard seed. They grow on you. 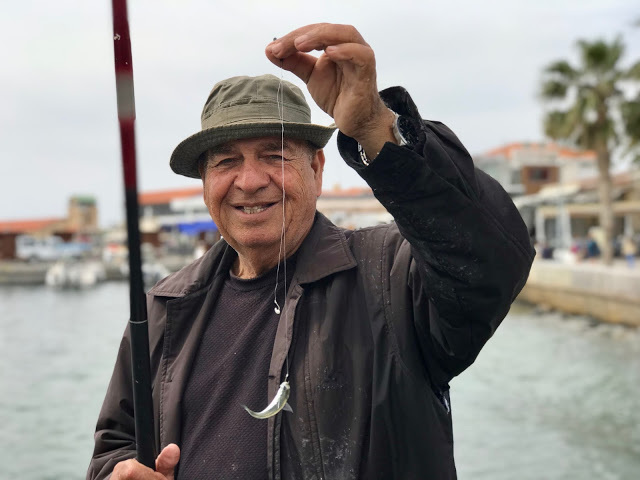 What the Cypriots don’t know about cooking fish isn’t worth knowing. I had simply grilled fish in several restaurants: tender flakes, perfectly seasoned. 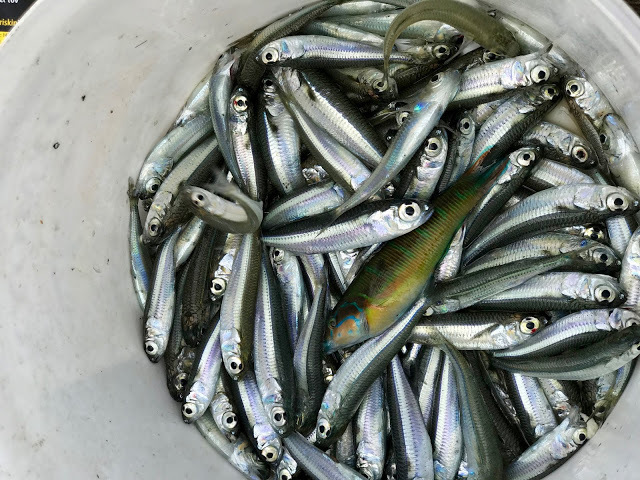 In Paphos I saw a guy catching sardines, a bucketful in three hours. 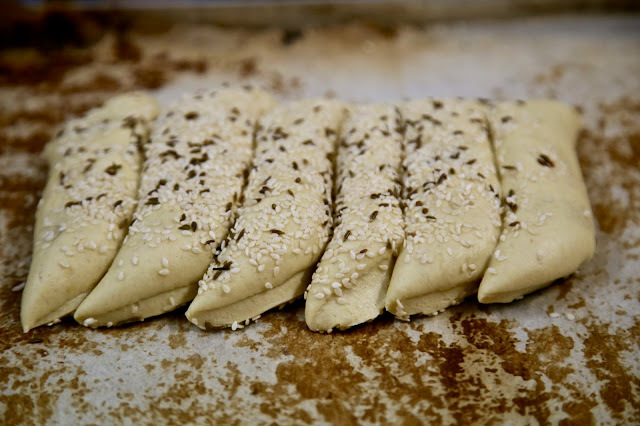 The traditional loaf of Cyprus, Koulouri, is pieced together like a caterpillar of dough and covered with the ubiquitous sesame seeds. Each section can be easily broken off for dipping, wiping, dunking. Separated and dried these become rusks, Daktylos, rather like the Cretan dakos. 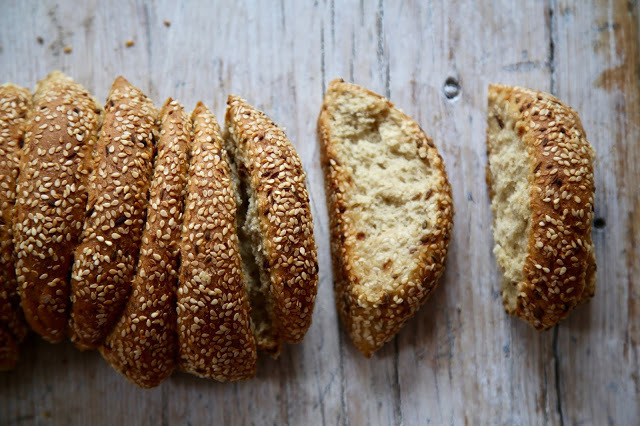 Useful for villages that aren’t near a bakery – the rusks last virtually forever. BBQ and grilled meat, particularly lamb kebab is a speciality in Cyprus. Obviously I didn’t try it but you may want to! Note: No toiletries were provided in these hotels on my visit, so take your own shampoo, conditioner, shower gel, etc. Easyjet operates flights to Paphos from London Gatwick and Manchester airport with fares starting from £26.49 one way. British Airways operates flights to Paphos from London Gatwick with fares starting from £268 one way for March time. So evocative! 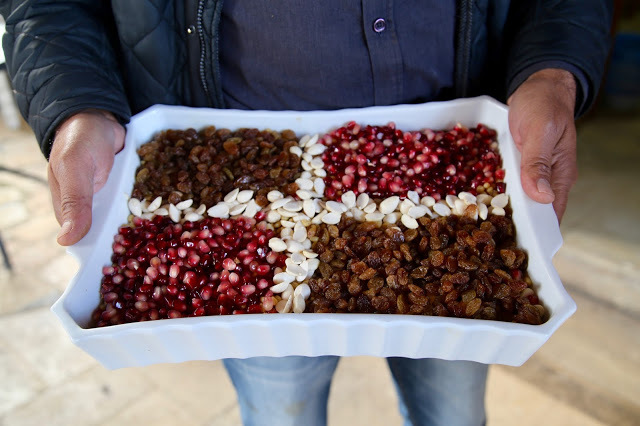 Based solely on this post, I am all set to visit Cyprus and sample some of these goodies. 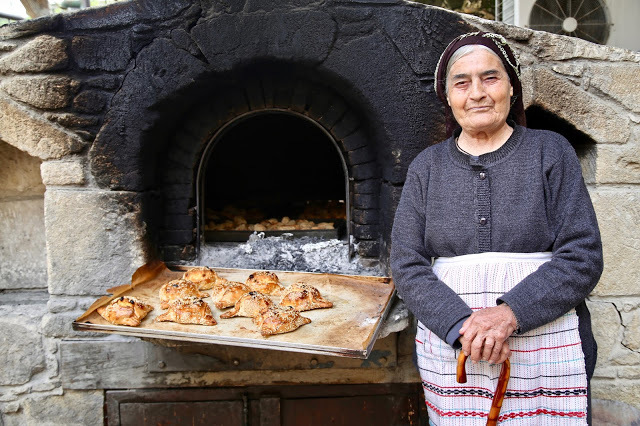 To be honest I was surprised at how rich the cooking culture was….I really love the way that Greece and Cyprus take Lent and Easter traditions so seriously. This morning I was tucking into my hot cross bun, and I guess we have our traditions too.